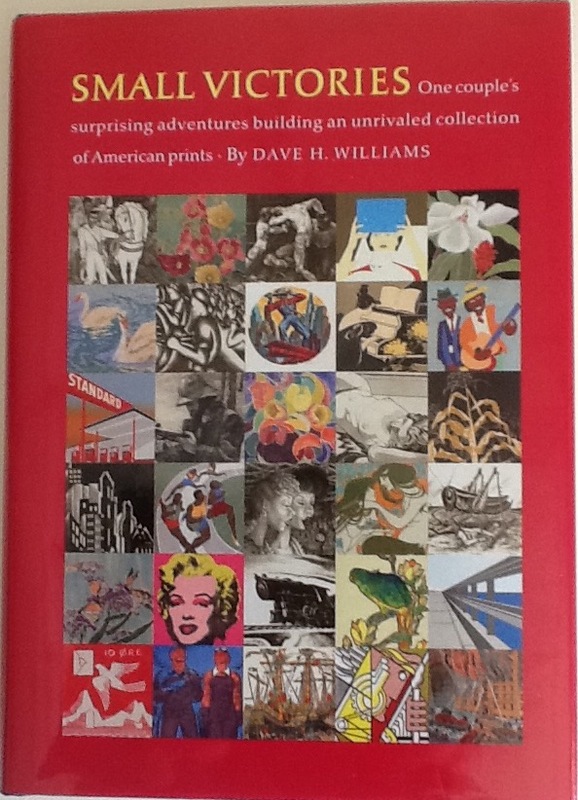 “Small Victories: One Couple’s Surprising Adventures Building an Unrivaled Collection of American Prints” by Dave Williams (Boston: David R. Godine, 2015) is a great read for any collector. The book chronicles the “small victories” of Dave and Reba Williams in collecting over six thousand prints. It is not a book about art although there are many good observations about individual works, artists and schools of art. It is a book about the collecting of art. There are many great stories about the prints acquired and the prints that got away. Anybody who collects art whether it be pottery, paintings or prints can relate to and learn from their experiences. I first learned of the Williams’ collection by browsing the collection of prints in the National Gallery of Art. I kept coming across their names as the donors of prints that I admired. So I did a search on “Dave and Reba Williams” and came up with over 6,000 hits. They have donated almost their entire collection to the NGA so that others can enjoy the fruits of their collecting endeavors. When I saw that Dave Williams had written a book on their collecting experiences, I had to purchase it. I was not disappointed. Given the tight collecting parameters that the Williams’ set for themselves, it is interesting to note that quite a bit of the book is about prints and print makers who do not fit in their original criteria. But that is also the nature of collecting. Sometimes the active mind starts out in one direction, one interesting finding leads to another and soon a whole new line of thinking emerges. Some of Small Victories most interesting stories are in the chapters on the resurrection of the screen print, the Mexican muralists and early American prints. The connection described in the book between the Mexican muralists and American print makers is a little known but important part of the development of American art in the twentieth century. Some purchases are home runs, some are singles and some are strike outs. (If you talk to a collector with no strike outs, you are not talking to a collector.) It is like any endeavor – you cannot win all of the time. That fact makes the small victories even more enjoyable. All in all, “Small Victories” is a very readable, enjoyable book with lots of great collecting stories and good collecting tips. If you collect prints, it is a “must” for your library.